Welcome to a very special, Alex Might Have the Flu Edition of Waiting for! I've had this wonderful and incessant headache since the weekend, and it is showing no signs of going away. Add in a slight fever and an overall feeling of never wanting to leave the warmth and security of my comforter...and I might just be getting sick. Or, I might very well be sick right now. Which means I won't be making my Wednesday run to the LCS, for fear of infecting the legions of comic fans who haunt the place on a weekly basis. See? I'm not all bad. I will, however, put a call into my retailer and ask him to put aside a few books for me. Which books, you ask? Well, even though such a question sets up a perfect segue, I need to made a detour into digressions-ville for a moment. I went online yesterday to check what books were shipping, and I came across a...um, let's call it an anomaly. From Marvel Comics this week comes the Marvel Holiday Spectacular Magazine 2009. Ummm...huh? We're a few days ahead of Halloween, and Marvel is releasing its annual Christmas special? Doesn't that usually ship in...I dunno...December? Well, I guess with the economy the way it is, retailers (and giant corporations like Wal-Mart and Toys "R" Us, for that matter) want consumers to start thinking about holiday shopping earlier than ever. The price of the book has to be wrong. $9.99?! For a comic book? For a holiday comic book that ships in late October? If that's not a sign of the times, I don't know what is. As I do with the annual Halloween specials, I like to pick up the Marvel and DC holiday specials, as well. It's just a nice, goofy way to spend a few minutes on Christmas Eve. It's fun, and I like doing it, so I'll continue to do it, thank you. But for $9.99, over two months before the holiday? Um...no. I guess I won't be reading a Marvel book by the fire this year. I know many say that comics are "recession proof," but really, guys, let's not go crazy with these prices okay? I understand that paper costs a ton these days, but is there anyone out there who will buy a new comic for ten bucks? Now that I'm all fanboy angry in addition to being real person flu-y, let's get to the list for this week. I'm gonna make these quick, since I need to not be upright for much longer. First up is this week's spotlight book, the Abe Sapien One-Shot, from Dark Horse Comics. Dark Horse is in the middle of a very cool promotion called One-Shot Wonders, where they put their biggest titles (Goon, Buffy, Hellboy, Star Wars) on display in a series of one and done stories. The idea is for people who have never read these books to jump on, with no strings attached, and give the books a try. A good idea, and with each issue carrying a $3.50 price tag, it's a nice way for those on the fence about a certain series to dip their toe into the water without having to plunk down fifteen dollars on a trade. 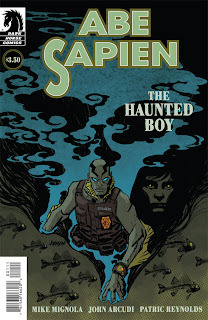 In his earliest days as an agent of the B.P.R.D., Abe Sapien is sent on a simple mission to investigate a haunting following the death of a young boy. What he finds there is far stranger and more deadly. Mike Mignola and John Arcudi team with newcomer Patric Reynolds, who made his professional debut this summer on MySpace Dark Horse Presents, for this nightmare of corrupted innocence! So, if this sounds interesting, or if you've wanted to give the Hellboy Universe a try, I'd suggest picking this one up. And kudos to Dark Horse for this new campaign. It's a good idea, and I hope it brings them new readers. And since I'm starting to wane a bit here, let's do a quick run down of the other books I'll be sure to pick up this week. Blackest Night, issue four, from DC superstars Geoff Johns and Ivan Reis, is the latest addition to the series that continues to impress. Now, despite its delays, this is still a must-read title if you're even a little bit interested in the DC Universe. Johns is pretty much shaping the immediate (and, likely, long-term) future for the publisher's major characters and books, and the story he's telling is accessible and, frankly, a lot of fun. Summer's hottest event explodes in this critical issue! 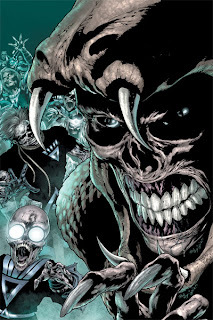 Hold on to your power rings, because the secrets behind the Blackest Night finally stand revealed! While Earth is evacuated, Hal Jordan embarks on a brave journey to the darkest depths to uncover the truth behind the Black Lanterns! You won't believe what he uncovers! Pretty cool, super hero-y stuff. There's also the latest issue of Green Lantern (issue 47), written by Johns, which promises to feature a battle that any GL fan is going to want to see. And if those two books don't quite do it for you, Johns has three (count 'em, three!) titles shipping today. In addition to the two GL books comes Superman: Secret Origin, issue two. A classic-in-the-making, Origin is drawn by the amazing Gary Frank, and it's great, great stuff. Finally, from BOOM! Studios and written by the legendary Howard Chaykin, is Die Hard: Year One, issue two. I picked up issue one last month (and finally had a chance to read it while in bed this weekend), and let me tell you--this is classic John McClane. 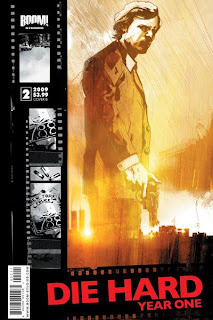 The story follows McClane's first days as a beat cop in 1970s New York City, and the book oozes with grit as Chaykin's grasp of crime fiction and ear for dead-on dialogue shines. BOOM! Studios continues to present America's greatest action hero translated into the sequential art form for the first time! Drunks, pimps, freaks and the debauched rich. It's all in a night's work for NYPD rookie John McClane. But what happens when 1976's toughest kid on the street runs into a dark conspiracy involving a blonde on the run? With McClane, it means the fun’s just starting. Join legendary industry creator Howard Chaykin on a thrill ride that's rung up over $1 billion in box office worldwide and become the gold standard for classic action! Yippee Ki Yay! If you're a fan of the movies, then run out, find issue one, and grab issue two. You'll thank me later.